We recently hosted a webinar presentation with author and speaker, Your Nerdy Best Friend (a.k.a. Beth Ziesenis), entitled How Membership Professionals Can Stay Organized On The Go. It’s now available on-demand! Take a break and watch Beth share hints and strategies for managing your day from sunrise to sunset. She divulges the scoop on several mobile apps and software programs that make a difference in day-to-day life. She highlights new technology available with augmented reality, the time saving value of Mile Tracker, and IFTTT - a great resource for managing projects and commitments at home and the office. 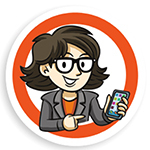 Beth is a technology expert who speaks all over the country about the best free and bargain apps and online resources that will help people “Release Their Inner Nerd.” Her goal is to help membership professionals become more organized, efficient, and awesome at work and home. She has written two books, including Nerd Know-How: Apps, Tech Tools and Tips to Get Organized, Get Creative and Get Ahead. Check out ChamberMaster’s blog post: 8 Ways for Chamber Pros to Get (and stay) Caught Up at Work for simple tips for making the most of your day, it’s a must-read.